Strong herding instinct stems from the historical purpose of the Greater Swiss Mountain Dog. Though bred to function as a draft dog, the Swissy was truly multi-purpose and was also used to manage livestock (primarily dairy cattle) in the mountains of their native Switzerland. Swissys demonstrate these abilities through herding trials with various types of livestock. The purpose of non-competitive herding tests is to offer herding breed owners a standardized gauge by which a dog's basic instinct and trainability are measured. 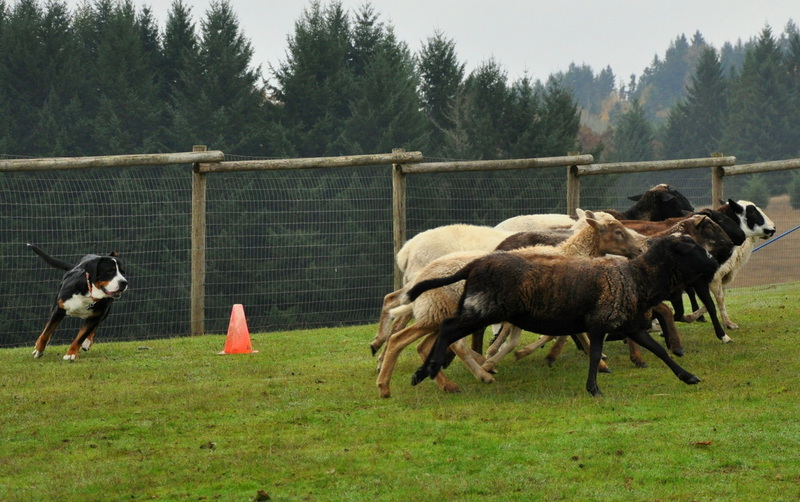 The Junior Herding Dog program, for dogs at the beginning levels of training, is run on a noncompetitive pass/not pass system, and leads to the title "Junior Herding Dog" (JHD). To earn a JHD, the dog must demonstrate its ability to collect and control stock, put stock in motion, move the stock in straight lines and turns, negotiate obstacles and come to a reliable stop at the pen. The stock must be taken through both corner panels and through the center obstacle to qualify. Course time is 8 minutes. Herding Ranch Dog level I takes place on a course which vary in detail while including specific requirements. Exercises can include a gather, fetch/drive work, pen work, sorting work, and various elements such as chutes, bridges, holding the sheep in place, etc. HRD trials may use combinations of open fields, arenas and pens. For more detailed information please visit the Greater Swiss Mountain Dog Club of America website.